Soaring high over South Africa, the Drakensberg offers mountainous scenery, fresh air and some superb spots to stay at. And none better than the Mount Aux Sources Hotel. You wont be sorry. What could possibly beat this view? Champagne Sports Resorts is nestled in Champagne Valley in the central Burg. 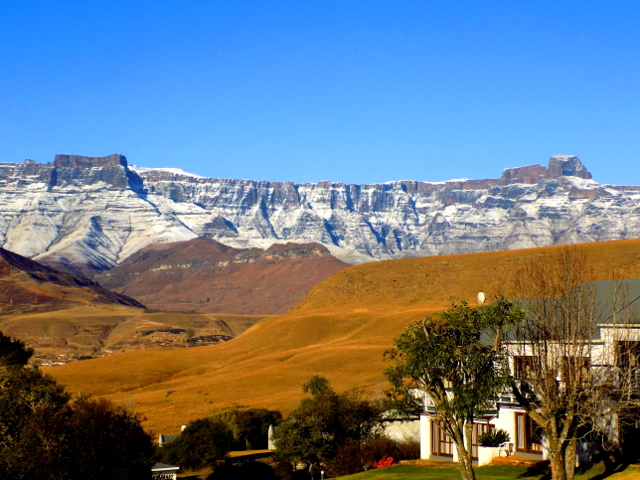 The Drakensburg earned its name 'Dragon Mountain' due the silhouette of the mountain being likened to a dragon. The resort is a sportsman's paradise. It is set overlooking an 18 hole championship golf course. The course is hilly and an easy course to play on according to my golf mad son. There are tennis courses, a spa, children's play area, trampoline, bowls, putt-putt, gym, outside swimming pool and gift shop. The restaurant offers a full sumptuous buffet but the price is exorbitant, it is worth considering eating there on a Thursday evening where it is possible to benefit from the resorts timeshare discount night. The poolside restaurant during the day is more reasonably priced and offers a good selection of food. This also doubles up as the resorts coffee shop serving the perfect cappuccino and the children's favourite – milkshake in a variety of flavours. The lodges are around 10 years old thatched and large. It offers everything one requires for a holiday, with a fully equipped kitchen, TV, Open fireplace and an outside braai area with stunning views onto the mountain range. My only complaint would be the lack of proper bedding for those sleeping on the sleeper couches in the lounge. It is a resort that is ideal for children who are old enough to take advantage of the freedom it has on offer. We went with another family and my friend and I hardly set eyes on our children when we were at the resort. The boys were off playing golf and tennis every day, stopping for a milkshake when the need arose. The girl's spent most of their time osculating between the putt-putt, children's play area and the tuck-shop arriving back with copious amounts of sherbet. Their treat was to experience their very first facial in the resident spa. My friend and I enjoyed the days relaxing on the grass area outside the lodge overlooking burg, reading, chatting and gazing across the golf course and onto the mountain view in the distance. We ventured out a few times. One of the trips involved a delightful afternoon being entertained by the Drakensburg Boys Choir, a truly world class performance. These boys, ranging in age from 8 to 15 years old board at the 50 year old school. The show is preceded by a small tour where we got to hear anecdotes of the school's history and setting. The performance is memorable. My children initially didn't want to go and listen to choir singers, yet they had a fabulous time and are fully converted to this form of entertainment. Coming from a teenage male is something! I highly recommend booking tickets, their performances are held at the school every Wednesday during term time. We squeezed in a visited to learn about bees and grab a cappuccino at Scrumpy Jacks. The guide taking us on the tour was recently attacked and stung by 800 African bees, all over his face and neck. He was lucky to be alive and to retell his tale. The quantity of bee venom in his system will not go away and he is living on a concoction of medicines to stay alive. We saw a working hive; purchased some honeycomb, some honey and some delicious peanut brittle made with ... you got it ... honey. Another place that we frequented was The Bakery coffee shop which was in a delightful setting selling mouth-watering food, cakes and breads. The little shop attached, offered knickknacks for the home along the line of distressed wood in the French provincial theme. We also visited a local carpet weaving shop, with glass windows providing views of the weavers at work. It is adjacent to the Waffle Hut where you get to enjoy waffles and hot chocolate with flakes melting in them – delicious. On route back to Johannesburg we decided to take a detour passing the natural Drakensburg Amphitheatre, which unfortunately was shrouded in cloud, and onto the Golden Gate, stopping for lunch in Clarens, the jewel of the Freestate, before winding our way home. You don't have to leave South Africa to find "Shangrila"
The Zulus referred to the row of jagged mountain peaks that seemed to pierce the sky as,"Ukahlamba" ("barrier of the spears"). The Voortrekkers must have thought in mythical terms and imagined the "spears" to have been the spines or the teeth of a dragon as they called it, "Drakensberg" ("Dragon's Mountain"). The Drakensberg Mountain Range, the second largest on the continent of Africa, is the most salient geological feature of the Escarpment. The range wraps its serpentine body for 1000 km, from the extreme northeastern corner of the Eastern Cape to form the natural borders between Lesotho and part of the Free State with KwaZulu Natal. Most of the mountain range is managed as national parks. The area known as,"the Drakensberg" or, "the Berg", is divided into the following tourist regions: Northern, Central and Southern. The Northern Drakensberg extends southward from Oliviershoek Pass and includes all 8,000 hectares of the Royal Natal National Park and the northern part of the Ukhahlamba Drakensberg National Park as far south as Cathedral Peak. Both parks were designated as one UNESCO World Heritage Site in recognition of: 1) the area's guardianship of 4000 years of the history of the San people preserved in the largest natural "collection" of Bushman rock paintings south of the Sahara - (it has been estimated that 20,000 individual ones are on display on the walls of some 500 different caves and overhangs) and 2) the incomparable natural beauty. The Royal Natal National Park is part of this World Heritage Site not only because of its breath-taking beauty but also because of Cannibal Cave where members of local tribes, hiding from a murderous rage of Shaka Zulu, resorted to eating human flesh to outlast his latest campaign to exterminate his competition. This Park is renown for the following major geological features: 1) The Amphitheatre - a rock wall approximately 5 km. in length that reaches 1,000 metres in height. 2) Mont-auxSources - the highest dome that rises from the relatively flat plateau of the Amphitheatre and the source of the largest river in K.Z.N.,the Tugela River, and reputably the source of the Orange and Vaal Rivers. 3) The Tugela River begins its journey as, Tugela Falls, the second highest waterfall in the world, which cascades down 947 metres for 5 different drops on its way towards the Indian Ocean. South of the Royal Natal is the heart of the entire Drakensberg, the Ukhahlamba Drakensberg National Park. Notwithstanding majestic mountains with fairy tale names like Champagne Castle, Giant's Castle and Cathedral Peak, this Park covers 243,000 hectares with: walking, hiking, biking, 4x4, horseback riding and mountain trails. High altitude grasslands abound with: rivers, lakes, streams and dams teeming with trout and other fish. Eland,oribi and baboons are regularly sighted on the steep slopes underneath the Escarpment, with occasional appearance of: blesbok, mountain reed buck and duiker. Leopards, jackals, black wildebeest and zebra share the high altitude grasslands with a recorded 24 varieties of snakes; 299 species of birds (including the black eagle and the rare bearded vulture) and 2,153 species of plants many of which are endemic and/or globally threatened. Besides the geological features already referred to in the National Parks, Northern Drakensberg has the greatest concentration of battlefields in South Africa. The Voortrekkers first encountered Zulu warriors when they left the Western Cape and crossed over to and settled in KwaZulu Natal (1836-1852). History buffs can visit war memorials to commemorate: The Battle of Blood River fought on 16th of December,1838, during the Boer-Zulu War; the Battles of Isandlwana and Rorke's Drift fought on the 22nd of January,1879, during the Anglo-Zulu War (1879); the Battles of Laing's Nek, Ingogo River and Majuba Hill fought during the First Anglo-Boer War (1880-1881) and the Battles of Colenso, Spionkop and Tugela Heights fought during the Second Anglo-Boer War (1899-1902). Also on the history buff's itinerary would be the Ladysmith Siege Museum which documents the tragic loss of more than 20,000 Boer women and their children as well as uncounted 1,000's of blacks who died mainly from starvation and disease as the British Empire's prisoners of war during the Second Anglo-Boer War. As varied as the activities are for the traveler to enjoy in the Drakensberg, so is the smorgasbord of choices for accommodation. Although most accommodation in the "Berg" consists of self-catering B&B's, lodges, inns and guest houses, choices range from: 5 star hotels and game lodges, luxury tented safari camps, or private game farms to: caravan parks, camping sites and bush back-packing. There are very popular venues in Northern Drakensberg that still offer special rates. The Cathedral Peak Hotel sometimes runs a midweek special(stay for 5 nights/pay for 4) and week specials (stay for 7 nights/pay for 5. The Drakensberg Mountain Retreat / Vergezient Lodge sometimes runs accommodation specials in the off-season. Central Drakensberg extends southward from Cathedral Peak (3148 metres) to Champagne Castle, at 3248 metres, the highest peak in the region. This region is home to the world famous Drakensberg Boy's Choir. During the school terms the Drakensberg Boy's choir performs weekly concerts on Wednesdays at 15:30. Accommodation is available for those afficionados who would like to stay the night. Because the boys tour extensively, it is advisable to check their website for availability and directions to their 100 acre estate. For the golf enthusiast , Central Drakensbrg not only offers the most choices of the entire Berg with two 9-hole and two 18-hole courses,but also excellent accommodation at golf estates-(Check out the Gowrie Farm Golf Lodge (gowrie.co.za) Those travellers who enjoy bowls either for recreation or competition would be remiss if they did not visit the well-known and popular Nest Hotel Bowls Club. 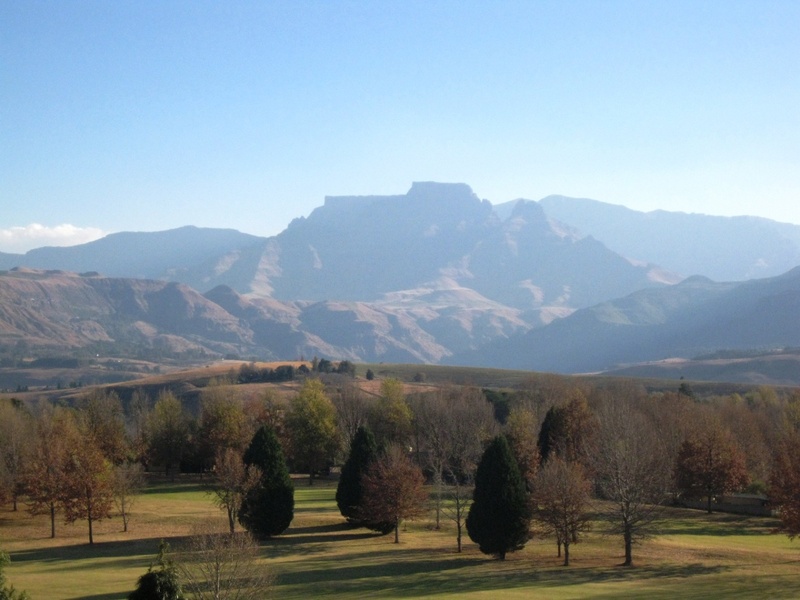 The Nest Drakensberg Resort Hotel often runs off-season specials. In addition to the majestic beauty of our Creator's handiwork, the Berg also showcases man's creativity. Central Drakensberg is the heart of the arts and craft area. The Midland's Meander is South Africa's largest and most popular arts-and-crafts route. Feel like walking for the equivalent of the distance of three marathons? That's how far one would walk if she stopped at every one of the 100 stops to browse all the shops on each of the four different converging routes for the total of 80 km! Here's an idea. Why not plan to do all of your Christmas shopping in the Natal Midlands this year? Think of the unique selection of gifts to choose from the variety of shops of: potters,weavers, wood-crafters, leather-workers, herb growers, cheese makers and even beer brewers. The more adventuresome traveler not only has some of the best walks to take, hikes to enjoy and caves to explore but also white water rafting trips, quad bike riding, off-road carting, abseiling, archery or even a "foofie" slide - all courtesy of the family owned business by the name of Four Rivers Rafting and Adventure. Accommodation specials are available in Central Drakensberg. Heronmoor Retreat in Mooi River sometimes offers savings on mid-week stays (Sundays - Thursdays). One place to consider for an affordable yet basic family accommodation is the Threeways River Getaway in Mooi River. The Getaway offers a spartan yet family and pet-friendly self-catering venue with farm animals and special facilities for children: playground, camps, and for parents-a creche and baby sitting is available. Check out the luxurious accommodation available in the Southern Berg. The Amazian Mountain River Lodge in the area of Underberg sometimes runs special offers - all rooms are luxury honeymoon suites! Qambathi Mountain Lodge, a mountain game lodge and private game reserve, sometimes offers special discounts off standard rates for South African citizens - ccommodation consists of only 6 suites (No children under 12 allowed). For the "huntin'-fishin'-shootin'" crowd the Sani Valley Fly-fishing and Game Lodge offers affordable accommodation (by Drakensberg standards). For the ultimate "foodie" experience, the Cleopatra Mountain Farmhouse, a "haven for food lovers" and an "intimate gourmet getaway", will cause your palate to rejoice and your taste buds to jump for joy when you are treated to nightly 6-course gourmet dinners.